In connection with this year’s World Championship in Kazakhstan, Astana, there have been meeting activities, training and graduation to higher degrees. This time there were several well-known WKO profiles who stood on the ranks to test their level. Among the grades two very Significant persons was at the line of testing. We are taking a look towards Hungary this time..
Hungary as we all know a great Kyokushin-country, with high quality and a very strong tradition of Kyokushin Full Contact Karate. Hungary have always been a central part of Kyokushin in Europe, and to be so, hard work in a systematic matter must be done. Two (among others) was getting award from many years of hard work – and of course this did not come easy! This is something to point out, because “the world” today have some own theories about thing like grading. Now it “possible” to have a higher rank than Sosai Oyama himself. 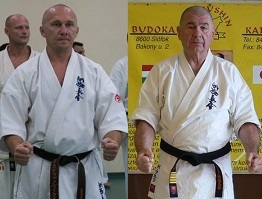 Furkó Kálmánnak Shihan, a person that has given enormous of himself to spread Kyokushin Karate – not only in Hungary, but also in Europa as well. Born in 1947 came early in contact with martial arts, combined with military education – two factors that walked hand in hand for many years. 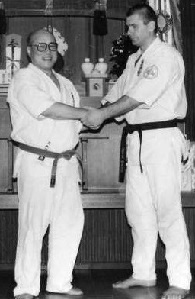 Meting Sosai Mas Oyama several times, graduated to 1st Dan in 1978, after opening own Dojo. Being in front of those who went out to participate in Internationale tournaments, entering tournaments in Poland in the mid/late seventies. This resulted in participation in the World Championship 1979. Graduated to 3rd Dan under Oyama Sosai, in Hungary -83. Also conducted fifty-men Kumite. Invited to Japan by Sosai Oyama 1984, and was studying in Honbu for a long time, coming home 4th Dan. Counties his hard work, and awarded 5th Dan in 1989, 6th in 1998 6th Dan. Being active in all kind of organizing in Hungary, as well in Europe well deserved 7th Dan 2008. József Stefanovics Shihan. Well known for many trough the Kumite training, and being one of the leading coaches in Europa. Not only producing high level fighters together with other top coaches from Hungary, but have also a fighter history self. Also participating in the World Championships, fought among others legendary Valeri Dimitrov, Bulgaria. Being the head instructor of Victory Club in Hungary, and always pressuring himself, reflects his result on the graduating test in Kazakhstan. Having excellent scores on the test, inn Kihon, Kata and Kumite – 5th Dan! This is what inspire more to work even so that we become older day by day – the best you can always. Slowly but certain reaching goals. József Stefanovics started Karate in 1985, and from that it took him up 1996 for 1st Dan. Three years later, 1999 2nd Dan, and 3rd Dan in 2005. 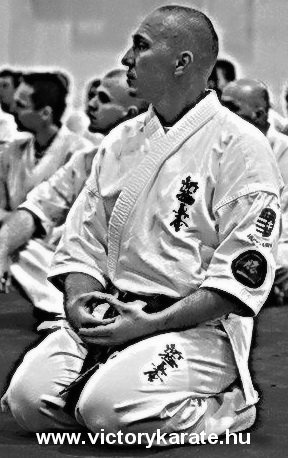 2011 was the year for the graduation to 4th Dan, and now in 2017 5th Dan.